So, I ran into my friend Greg at the Philly show and he loaned me a few really cool pens. I don't have terribly many pictures of these pens, but you can find the video on my YouTube channel. I really suggest watching that video for a better idea of what these pens are like. Quite the assortment, huh? Let's talk about them from left to right. The first one is an ST Dupont Olympio. This pen comes in a variety of styles and in large and small sizes. Obviously this is the gold one, and it's the larger size. It's actually a really big pen. Dupont pens always catch my eye at shows. They've got an interesting style, their nibs are always beautiful, and they have one of the best slip caps in the biz. Seriously. Listen to the cap snap on in the video. The pen posts. As cool as the Olympio is, though, it didn't really click with me. It's just too ostentatious. 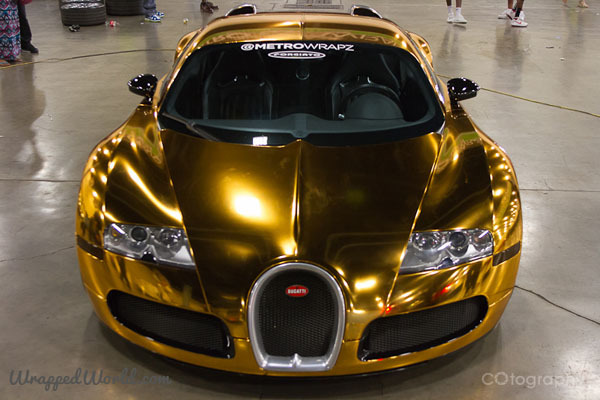 It's huge and gold, and it feels like I'm driving a Bugatti to a pawn shop. It doesn't make it less rad. It just makes me a little uncomfortable. 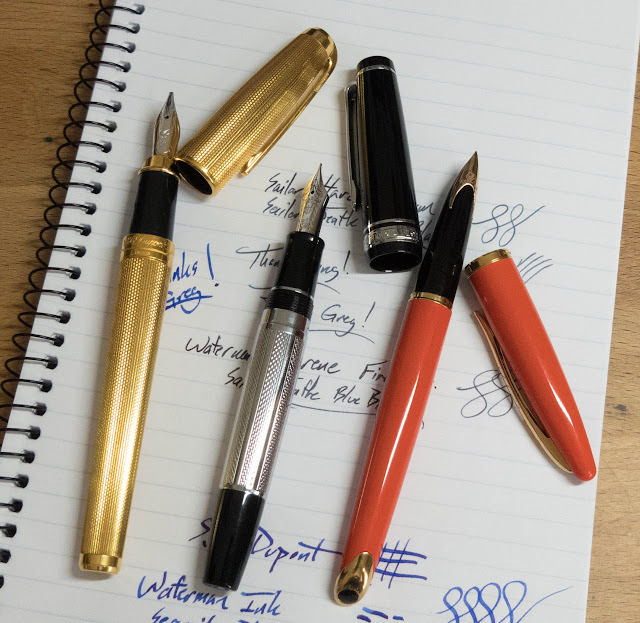 Of all of these pens, the Dupont has the best nib. For sure. 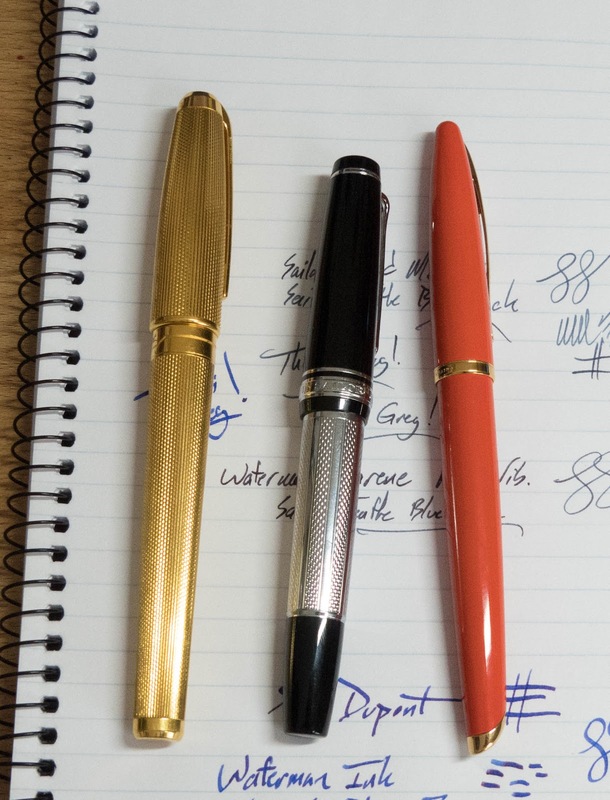 The second pen is a Sailor Pro Gear Regency Stripe. That's basically a Sailor Pro Gear with a metal shell around the barrel. It looks really cool, and the weight is probably a plus if you think the regular Pro Gear is a little too light for you. That weight is in the middle of the pen, and that's kinda odd to me. It's a nice pen, but the weight is a little weird compared to the regular Pro Gear, and I can't see any way to justify the price-hike. It's a big hike. The last pen is a Waterman Carene. I've had this pen on my list for a long time. They're kind of expensive, though, and that has kept me from getting one without testing one out. 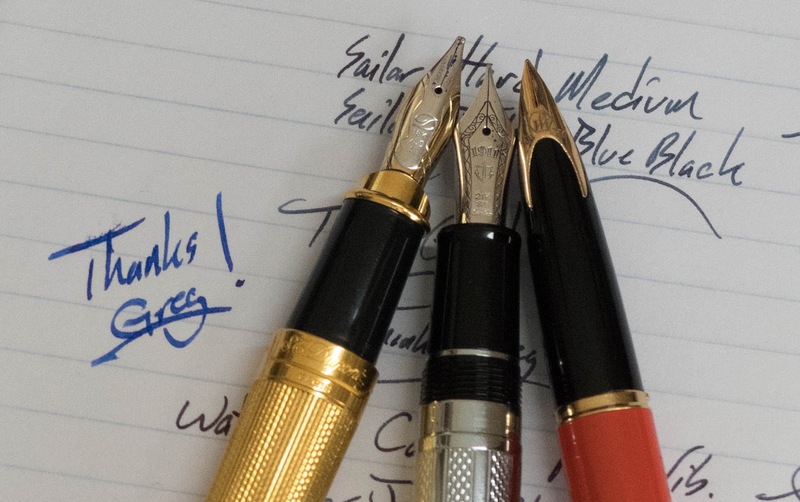 I'm also a little leery of inlaid nibs after my experiences with the Sheaffer Targa. That said, I'm a big fan of this pen. The shape is awesome. The slip cap is great. 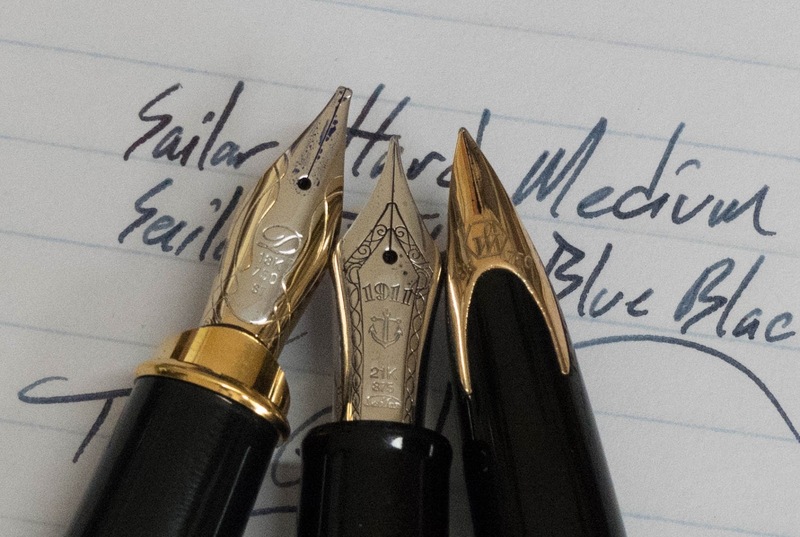 The nib is unique, pretty, and writes perfectly. The clip is articulated. There's nothing not to like. Well, you won't like it if you want a bouncy nib. It's a nail. A nice, reliable nail. Thanks for letting me borrow these cool pens, Greg, and I hope we can do this again soon!